As former Labor politician Karl Hampton (right) is settling into his $140,000 job as the CEO of Aboriginal radio station CAAMA, doubts are being raised about the way he was selected. CAAMA spokeswoman Tracey Brand has claimed that Mr Hampton’s appointment was made “after an open national recruitment process conducted by the Office of the Registrar of Indigenous Corporations (ORIC)”. However, when asked for information ORIC communications manager Lisa Hugg told the Alice Springs News Online that its role in the recruitment included placing “an advertisement on our website advertising their chief executive officer position. Ms Hugg says it is likely that ORIC assisted CAAMA with procedural issues under ORIC’s recruitment assistance program such as a note taking service. 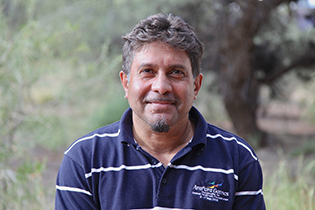 Meanwhile Gman, whose controversial resignation as station manager has drawn public attention to the crisis in CAAMA, has scored a job with Melbourne Aboriginal radio station 3KND. He is taking over from Jim Remedio (at left), a former CAAMA employee, with 30 years experience in community and national radio networks, and well-known in Alice Springs. CAAMA receives $3.3m a year in government grants, mostly from Canberra, twice as much as it raises from other sources. Gman has not responded to recent requests for comment but a source close to him, speaking on the condition of not being named, says he had not been told that his contract with CAAMA would not be renewed after May. On September 27 last year Mr Hampton, still the chairman, personally handed a letter to Michael Robertson, then CEO of CAAMA, the job Mr Hampton would later apply for. The letter told Mr Robertson his contract would not be renewed when it ended on December 31. Mr Hampton resigned from the board on December 20, according to documentation given to ORIC. The closing date for the job application was January 22 this year. The News has asked for comment on all this from Tracey Brand, on behalf of the board. We will post it when it comes to hand. @ Joe Davis: See comment from “Interested Community Member 2” and my note in this thread. Kind regards, Erwin Chlanda, Editor. Editor has any follow up occurred from Chair / CEO of CAALAS in this similar discussion. Same situation but less coverage. Congrats to the appointment to the new CEO at CAAMA. I write as a person who applied for the position and has the qualifications and experience to do this role. I was completely baffled at this appointment. The chairman to the CEO – is there a conflict of interest? Where is the good governance and clear and transparency? I would have thought Gman would have been automatically appointed, even as in interim. Now I hear that he was the wrong culture. Yet no one asked me what my culture was. Re S Taylor: I read most these comments with interest and amusement and comment when I feel that I might have a bit of an idea about what I’m talking about. If you are confused then so am I as I wasn’t aware of CAAMA having a deputy CEO. And probably not funded for one. Could you advise as to who this non-indigenous person is, please. It would be good for me and other readers to be fully informed in this saga before making unfounded comments. Or are you just presuming this because you don’t know what is going on within CAAMA. You are right, Another Observer – too many snouts – definitely too many snouts on the CAAMA board. Too many glorified nobodies on the CAAMA Board who think they know best. All hiding behind the ORIC “process” lie thinking that the public are just stupid. Who is the CAAMA chairman now? They have given Karl the job. Ask them. Take away the ORIC shield and what else have they got to hide behind? The truth is the process is murky and it is back to nepotism. It was a done deal before the ink even dried on the job advert for the job that was given to Karl. Are we getting to the point that we have too many snouts and not enough troughs? @ David X. So we agree. On the core elements. Good. So you remember me? In MLC Tower Woden? I must admit I remember a few Davids. But they all had a surname. David X? Nope. Escapes me. @ John Bell: I am well aware of your time in ATSIC, Mr Bell. I was there from beginning to end too. And I’m suggesting it was unfortunate that ATSIC was disbanded. Certain elements of ATSIC were corrupt, not the complete whole of ATSIC. In comparison then, our white governments must be models of excellence, not even a sniff of wrong doing or corrupt behaviour. My goodness! They only forced the Intervention on Territory Aboriginals, making Aboriginal people powerless, voiceless and captive – took away every shred of dignity. Yes, another white government inspired experimental failure. More than a blot on the integrity of Territory Aboriginal people I’d say, that will take a long time to recover from, if at all, if allowed to. No more government inspired social experiments, please. Finally, I never suggested ORIC was corrupt – just a paper tiger. Strewth mate! After 15 years in Alice I am becoming numb to these types of actions. If the chairperson of CAAMA is able to legally remove a sitting CEO, then proceed to successfully gain the position for himself at the next available timeline, then I assure you folks it will continue to happen in Alice Springs. I would like for this to be examined further, maybe by ORIC and post examination used as an example of what not to do in an Aboriginal organisation governance setting. I was speaking to a coupla mates last week who are working at CAAMA, not for long I rekon. They said there is heaps of bad vibes and real big money troubles in the place. Everyone reckons Karl planned the whole thing with the board and the short term CEO they had stuck in there. Most staff members are shocked Karl got the job but don’t want to say anything. They rekon the board is covering themselves by putting him on. They have been told they can’t talk in public so I though I’d just chuck this up for youse mob to see after reading this. Sorry to see GMan go as he has been a fantastic neighbour and has helped me a lot with some of my recent problems. They are a loveloy family and love Alice Springs. GMan has put his heart and soul into CAAMA and this is how he is treated. As for Karl, a failed Labor politician and former minister, only time will tell if he can step up to the plate as CEO. @ David: I hope you are not really suggesting that it was unfortunate that ATSIC was disbanded. Strewth mate. ORIC may well be a paper tiger. But there is no shred of evidence to suggest it is corrupt. ATSIC was corrupt; it held the Aboriginal and Torres Strait Islander electorate to ransom. I was there at the beginning on March 6, 1990 and I was there long enough to see where it was heading. A blot on the integrity of Aboriginal and Torres Strait Islander peoples. We are all well rid of that white government-inspired experimental failure. Karl is a top choice for the job; no recruitment process is without its foibles. We live in a small community and most people who do the moving and shaking around the place are connected. Get over it. ORIC is a paper tiger – has no real powers of investigation or powers to compel organisations to do anything. ORIC should have been wound up a long time ago like ATSIC was – unfortunately. This is just what happened to the Central Australian Legal Aid Service (CAALAS), but I think Karl would do a better job then the current CEO of CAALAS. Eileen Van Iersel was the board’s director and basically gave herself the position of CEO. I too would like to see her qualifications and to go through her selection criteria. Jobs for the Boys and Girls after politics is a firmly entrenched viral infection and a fact of life in this modern age of post-truth realism. As yet, there is no known antidote or immunisation program to eradicate it. Even if there wwre no such virus, job selection criteria are subject to “special measures” provisions that are activated prolifically under all State Territory and Federal discrimination legislation. As an Indigenous organisation, CAAMA is especially free to exercise these provisions in deciding who is best suited to the job. In these current times of jobs for former pollies and special measures, the door is open in the public and private sector to chuck out all the long-recognised ideals of fair play and comparative merit that was once the accepted standard. Things have devolved to a situation where it now comes down in the mind of the Average Punter to a simple question of whether or not the selected applicant is a good bloke or a good sheila (to coin a sexist phrase that is also unacceptable in this 18C age of universal offence-taking). I think Karl is a good choice for the CAAMA job. In my opinion, Karl is a good bloke. Hi Erwin, it would be interesting to know if Karl Hampton has the required qualifications for the CAAMA CEO position, or did the board hand it to him. It would be good to go through the selection criteria set for Michael Robertson and see what differences were made.